Wintry weather is set to follow the storms which killed 11 people and left thousands of homes with no power. Gales are continuing across Scotland and northern England following one of the UK's worst day of storms in 17 years on Thursday. The BBC Weather Centre reported strong winds in other areas, and predicted a UK-wide cold snap on Monday. A wind change bringing cool air from the icy North Atlantic will cause the drop in temperatures. Warnings of a freeze come as thousands of homes remain without power, while several flood warnings are also in place. 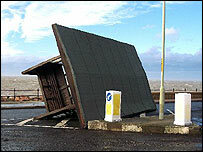 Insurers say the bill for storms, involving gusts of up to 99mph, could reach hundreds of millions of pounds. Winds of up to 60mph are expected across England and Wales on Saturday night and Sunday morning. The Environment Agency has four flood warnings in place for the Midlands, three in north-east England, two in north-west England and five in Wales. Snow is expected on higher ground in Scotland and northern England, with temperatures dipping sharply across the UK. On Thursday and Friday, high winds and heavy rain blew roofs off buildings, brought down trees and walls, damaged cars and lorries and flooded homes. Many homeowners will be able to claim on household buildings and contents insurance to cover repairs to property - although fences and gates are not usually covered. Head of property insurance at the Association of British Insurers, Jane Milne, said: "This sort of event is obviously dramatic and difficult for the individuals who have suffered damage... but it's not a problem as such for the industry,"
She said that in 1990 the bill for the severe January storms had come to £2bn. Many homes have been affected by electricity blackouts in the wake of the storms. Scottish Power said 2,000 customers in Wales were still without power on Saturday. About 19,000 households in the east of England alone still had no electricity on Saturday, although EDF Energy said it had reconnected about 10,000 customers in the previous 24 hours. Another 5,000 homes in southern England were still without power. Central Networks said many people in the West Midlands would remain without electricity "into the weekend". Meanwhile, British container ship the MSC Napoli, which became stricken in the English Channel 40 miles off the Cornwall coast after its engine room flooded in stormy seas, is to be beached. The Napoli's 26 crew were all rescued by helicopter after it was stranded on Thursday. The 62,000-tonne vessel, which is being towed towards Portland, has been sheltering in Lyme Bay. It has "serious structural failure", and with winds of severe gale force 9 predicted, the decision has been taken to beach the vessel east of Sidmouth.